Deadline for submission is this Sunday March 1st! 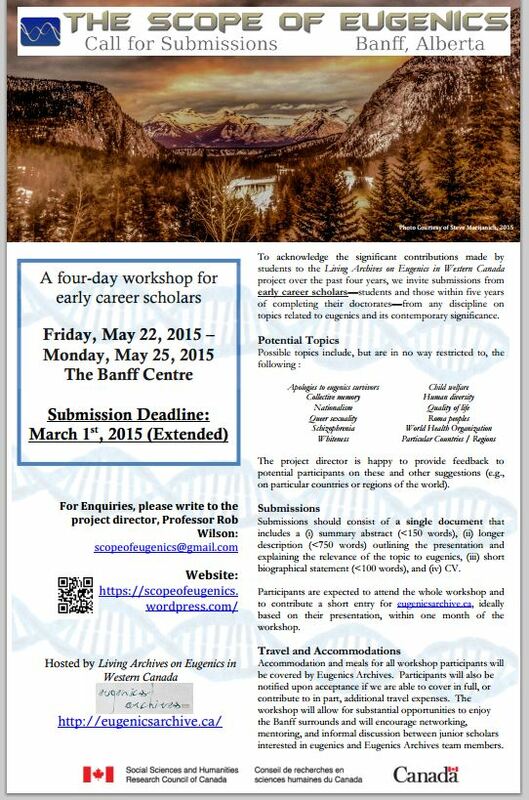 Don’t miss the opportunity to spend time with scholars and community advocates in the Rocky Mountains at the Banff Centre. 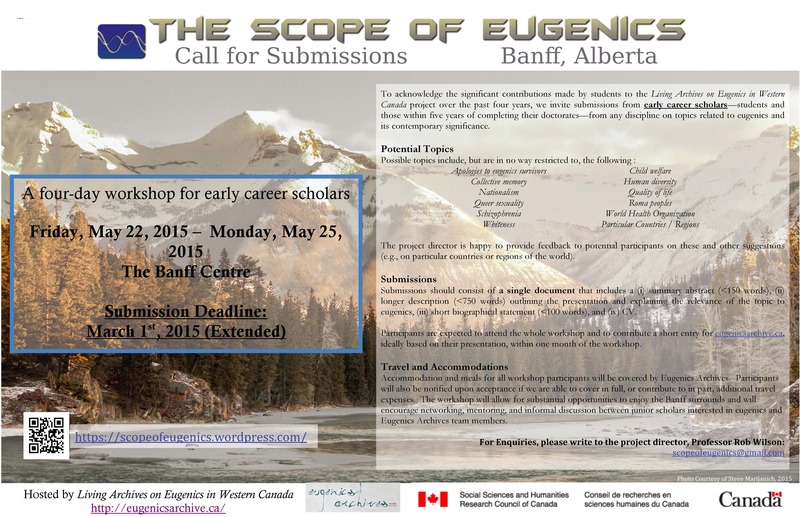 May 22 – 25th, 2015! Congratulations to the American Philosophical Association, which has been awarded a $600,000 grant from the Mellon Foundation to support PIKSI and other undergraduate diversity projects. See the full announcement at the link below. Less than half of working-age Canadians with physical and mental disabilities have a job, a significantly lower percentage than the general population, according to Statistics Canada. A data agency report released Wednesday coincides with International Day of Persons with Disabilities, a UN sanctioned day to raise awareness. The report covers data from 2011 and indicates 49 per cent of Canadians between ages 25 and 64 who said they have a disability could find employment. That compares with a 79 per cent employment rate among the general working-age population. “Canadians with disabilities include those with a physical or mental disability related to seeing, hearing, mobility, flexibility, dexterity, pain, learning, development, psychological/mental disorders or memory,” the agency says. About two million people across Canada self-identify in that category — about 11 per cent of Canada’s entire population for that age group. Out of those more than two million people, only about a million of them have some sort of job. Mild disability — 68 per cent employment rate. Moderate disability — 54 per cent. Severe disability — 42 per cent. Very severe — 26 per cent. Generally speaking, the more severe the disability, the less likely an individual will get work. Diane Bergeron is the national director for government relations and advocacy with the CNIB. She says the main problem that people with vision issues face in terms of employability isn’t a lack of skills — it’s a perception and an assumption that they can’t do the job, or that the workplace will have to accommodate them in some onerous way. According to the Statistics Canada report, having a university degree seems to increase the odds of finding employment, for both Canadians with disabilities and without. Employment rates for university graduates with mild, moderate and severe disabilities weren’t that far off from the rate for those without any disability — the rates for all the categories ranged between 77 and 83 per cent. But the employment rate of university graduates with a very severe disability was lower, at 59 per cent. A bias against disabled people with the appropriate level of education is a big problem, Bergeron says, because people with vision issues often face disproportionate difficulties in getting a job, even after they’ve gone out and obtained the necessary level of education. “Employers always tell me that their ideal employee has skills like strategic thinking, problem solving, drive and passion,” she says. Those are the types of skills that blind people have in abundance, as they need to use them to do countless daily tasked that sighted people — the “retinally dependent,” she quips — aren’t even aware of, such as getting into work in the first place. “All the skills you want in an employee are abundant in an employee who you have decided isn’t ideal,” Bergeron says. Statistics Canada’s numbers show education is clearly a factor in employability across all groups, and the numbers suggest that’s especially true for Canadians with disabilities. Among those with a severe or very severe disability and less than a high school diploma, the employment rate was only 20 per cent. That compares to a 65 per cent employment rate for the population at large of Canadians who didn’t finish high school. Perhaps most troublingly, people with disabilities often earn far less than other Canadians without a disability — even when doing similar work. Men with disabilities and who have university degrees and full-year, full-time work earned an average of $69,200 in 2011, compared to $92,700 for men with no disability. The numbers showed the same trend for women, although the gap was smaller. Among women university graduates working full time, employment income for those with disabilities averaged $64,500, compared with $68,000 for those without a disability. It’s a story that Bergeron hears often — the right person for the job is passed over because society has decided they might be “disruptive” to the workplace and not worth the cost of accommodating. Between 1971 and 1991 in Czechoslovakia, now Czech Republic and Slovakia, the “reduction of the Roma population” through surgical sterilization, performed without the knowledge of the women themselves, was a widespread governmental practice. The sterilization would be performed on Romani women without their knowledge during Caesarean sections or abortions. Some of the victims claim that they were made to sign documents without understanding their content. By signing these documents, they involuntarily authorized the hospital to sterilize them. In exchange, they sometimes were offered financial compensation or material benefits like furniture from Social Services – though it was not explicitly stated what this compensation was for. The justification for sterilization practices according to the stakeholders was “high, unhealthy” reproduction. They sterilized thousands of Roma women in this way. The Czech ombudsman estimated that more than 90,000 women from former Czechoslovakia became infertile as a consequence of such interventions. If the evidence for such treatments performed in the past is not alarming enough, there seems to be proof that this practice was not only common during the Communist era: there are women reporting the same crime in post-Communist times as well, even after Czechoslovakia split into Czech Republic and Slovakia. In what is today Slovakia, 1000 Roma women and girls were sterilized annually in the 1980s. Unfortunately, the practice of forced sterilization in this region of Europe seems to persist to some extent, with cases emerging in other countries as well. The European Roma Rights Centre pointed at two cases of Romani women who were sterilized in Hungary without their consent. One of them relates back to 2001, when a young woman, A.S. accused a hospital for sterilizing her without her knowledge. Following eight years of intensive lobbying, with several organizations started pressuring the government, in 2009 the Hungarian state compensated A.S. The court acknowledged that the surgery was performed without her knowledge, but it also claimed that the surgery did not harm A.S.’s reproductive capacity as the sterilization was purportedly “reversible”. The second case taken up by ERRC is still in process, as it was rejected in the first instance by the Hungarian Court. The victims of forced sterilization have begun to speak out against these crimes by creating a movement to stop forced sterilization and bring justice to the victims in the Czech Republic as well. Czech Romani activist Elena Gorolova was one of those who started the movement by founding Group of Women Harmed by Forced Sterilization. She is a victim too, sterilized while having her second child in 1990. Mrs Gorolova, like many other Romani women, was not able to file a civil lawsuit because the deadline for seeking legal action had already expired. Nevertheless, she tried to pursue legal justice with other women, moving her case from the local to the national and international level. They organized demonstrations, such as the one in Ostrava in front of the hospital infamous for sterilizing Romani women in large numbers. Elena is one of the eighty-seven women who sent their complaints to the Czech ombudsman, reporting forced sterilization. In December 2005, in his final statement on the issue, the ombudsman declared that sterilizations performed on Romani women are illegal. The story of Elena and the others is not the first policy of compulsory sterilization in history. The first was documented in the US in the beginning of the 20th century. African-American women were sterilized against their will, many of them without their knowledge, while they were in a hospital for other reasons or sometimes even while serving a prison sentence. More than 65,000 individuals were sterilized in 33 states in the framework of compulsory sterilization programs. This US policy was followed by several other countries, including Canada, Russia and Germany, that approved compulsory sterilization as a governmental practice. In the case of the Czech Republic and Slovakia, many lawsuits ended with the victory of the victims of sterilization. However, most of the pursuers kept their identity secret or the outcome of the case was not made public for other reasons. 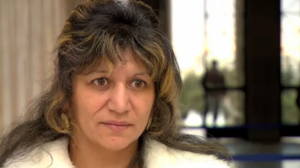 Elena Ferencikova was the first Roma women to sue the Czech Health Authority in 2005 for the damages she suffered when they sterilized her at the age of only nineteen. The court didn’t decide on financial compensation but the hospital where they performed the intervention apologized for sterilizing Elena without her agreement, damaging her future and her harming her status in her community. At the time of the intervention, she was a young bride, with the dream of having a big family. Until the most recent past, over 87 Romani women filed an official complaint against the Czech health authority The first action on the government’s behalf was an apology in 2009 during a press conference, followed by the report from the Czech Ombudsman about the illegality of the practice in 2005. The above case seems to be rather typical: the content of out of court settlements is not made public and the reason that women gained mere apologies from the hospitals is usually due to an allegedly expired right for financial compensation. On the other hand, there are cases whose outcome was made public, like one from 2012: the court made the decision that the government was at fault and the woman in question should receive a compensation of EUR 10,000. Looking at several cases of forced sterilization, a serious infringement of human rights is what should be emphasized, as reflected also by the recommendations from the NGOs’ side, the ERRC and the Czech Government Human Rights Commissioner Monika Šimůnková, who all stress the need for developing a compensation mechanism for all victims of sterilization. A well-functioning mechanism is needed since not all victims are literate enough, have the financial sources, or the knowledge to ask for justice in court. Majority of Czech ministers agreed and a mechanism should be developed by the end of 2013, as part of the already existing legal framework. However, there is a concern that many of the affected women will still be excluded from the opportunity to gain justice. To add a personal perspective on the issues at stake, I see many reasons justify the need for the government to develop a compensation mechanism. For instance, trends show they are losing cases on the international level. Developing such a mechanism would mean that the cases would remain on the local or national level. Another reason could be financial: whatever compensation mechanism the government develops, the amount of compensation is not equivalent to the cases decided by the European Court of Human Rights. The third reason could be that authorities are trying to escape the negative backlash caused by not assuming responsibility and not criminalizing this governmental practice. In conclusion, the development of a compensation mechanism could keep “embarrassing” cases from reaching international publicity, which could lead to public ignorance if no one realizes how many actual victims there are and in what circumstances these crimes happened. Of course, one could also argue that after years of injustice affecting hundreds of women, the fact that some women will receive justice might pave the way for others. Still, the question must be asked: is this enough? Is compensation enough? I am concerned that whatever compensation they eventually receive, the truly important development would be if governments themselves are seriously pushed to criminalize forced sterilization: only this could prevent these horrible stories from repeating themselves. While human rights can be violated by individuals or by institutions, they can only be defended by institutions. The European Court of Human Rights does not deal with single individuals who have committed crimes. Rather, it focuses on why the government in question could not take action against what happened. But where are the doctors, politicians and all the people who personally contributed to or carried out such surgeries, and when they are going to take responsibility for their actions? In order to take action against this human rights violation, blaming the Communist regime is not enough. The practice continues today and forcibly sterilized Romani women are still a long way from receiving true justice. Albert, Gwendolyn. “Forced Sterilization and Romani Women’s Resistance in Central Europe.” Forced Sterilization and Romani Women’s Resistance in Central Europe. N.p., 2011. <http://popdev.hampshire.edu/sites/popdev/files/uploads/u1149/DT_71_Albert.pdf&gt;. Holt, Ed. Roma women reveal that forced sterilization remains. N.p., 12 Mar. 2005. Web. <http://www.thelancet.com/journals/lancet/article/PIIS0140-6736(05)71063-1/fulltext&gt;. Decade of Roma Inclusion . Czech Prime Minister Apologizes to Victims of Coercive Sterilization. N.p., n.d. Web. 1 Feb. 2013. <http://www.romadecade.org/czech_prime_minister_apologizes_to_victims_of_coercive_sterilization&gt;. ROMEA. Czech Gov. compensates another woman over illegal sterilization. N.p., 11 Dec. 2012. Web. 1 Feb. 2013. <http://www.romea.cz/en/news/czech/czech-govt-compensates-another-woman-over-illegal-sterilization#&gt;. Open Society Foundations. Against her will – Forced and coerced sterilization of women worldwide.